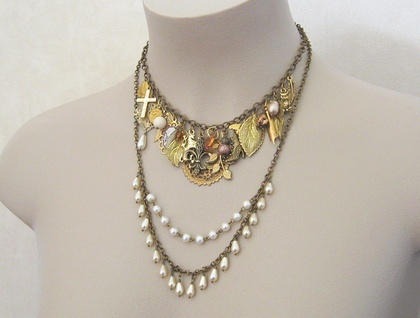 This one-of-a-kind statement necklace has two main strands: one laden with an excess of charms, beads, and dangles, the other comprised of antiqued-brass coloured chain with a short fringe of wire-wrapped, vintage glass pearls, and a row of faux pearls linked together by brass wire. The teardrop-shaped faux pearls are vintage Czech glass, which I wire-wrapped by hand and attached individually to their chain. Above them hangs a string of acrylic pearls on brass wire. I'm not sure how old they are, but they are probably vintage by now. and an owl charm and a feather charm, both made of pewter, plated with gold, and with an antiqued finish. 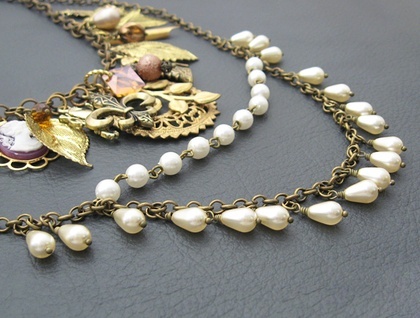 This queenly necklace fastens with an antiqued-brass coloured toggle clasp with an ornate design. "Rococo, adj. 1. (of furniture or architecture) Of or characterised by an elaborately ornamental late baroque style of decoration prevalent in 18th-century Continental Europe, with asymmetrical patterns involving motifs and scrollwork. 2. Extravagantly or excessively ornate, esp. (of music or literature) highly ornamented and florid." 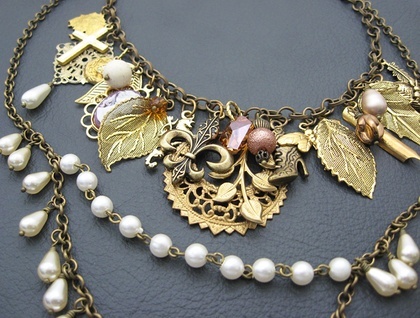 'Rococo' is a one-off Silverlight Jewellery design, never to be repeated. I spent many hours on it, ensuring that every pearl and charm hangs just right. The upper chain measures 42cm, including both halves of the toggle clasp. The lower chain measures approximately 60cm, including both halves of the toggle clasp. The filigree hoop stamping, near the centre of the charm strand, is 40mm from top to bottom. The brass cross charm near the left of the charm strand is 27mm tall, including the baile (the hanging loop at the top), and 16mm across. The purple cameo measures 19mm from top to bottom, not including its setting. The high-heeled Victorian boot charm is 28mm from top to toe, including the baile. Unlike most Silverlight Jewellery pieces, this necklace cannot be altered in length.